Is is safe buying weed from Craig's Weed? We’re one of 120+ dispensaries in the United States that are NOT operating under the federally-approved medical marijuana system. To qualify under the federal system, you’ll need to get a doctor’s approval and Medical Card to purchase from one of the legal states. Nowadays there’s allowed dispensaries to proliferate so people can safely access medicine, so long as there are no sales to minors or any gang affiliations. That being said, we’re a legal dispensary located in Maine but there is still a risk on both ends as we are crossing state boundaries for you without federal approval. 3. With all your desired products in your shopping cart, are on the shop page and are ready to Checkout, click on the View Cart button and you will be redirected to the Checkout page. 4. In the Checkout page, an account would be automatically created for you. 8. Your order will be processed and will ship out at midnight everyday. We’ll email your WOW/UPS tracking number as soon as available. Do you have a phone number for customer service? All orders received before 5pm (GMT-4) will ship the same day. If your order is received after 5pm (GMT-4), your order will ship the following business day. If you would like to add or edit your order, you’ll need to enter a new order and we will cancel your original order. Please email admin@craigweed.com with the order number you would like canceled. If you would like your order canceled and it has not shipped out yet, please email admin@craigweed.com. 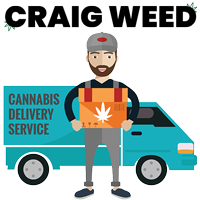 We are in the shop and answering emails from Monday to Sunday 24/7 to serve our customers #budtender. We accept E-Transfers, Cryptocurrency and all major credit cards, Visa Master Card, American Express & Discover via EscrowBitz Escrow Service. $25 for standard & $45 for express delivery (USA). International orders flat rate delivery fee is $60. For orders over $400, shipping is free. Orders are shipped by UPS, WOW& Xpresspost and a tracking number will be emailed after your order ships. You will receive your order in 1-5 business days depending on your preference (standard/express). Please allow an extra couple of business days if you live in a remote area. Your delivery is guaranteed (except for residents of the Middle East, or if you provide an inaccurate/incomplete address). Yes, 5% GST is included in product prices. Your order will be discretely packaged and double vacuum-sealed to protect and maintain your privacy. We ship using a priority mail gateway with nondescript boxes with no indication of what is inside. If you do not get your package 2 days after the expected arrival date, let us know and we will file a trace. If a trace is filed, we will conduct an investigation (which can take 2 business days to complete). If we can locate the package, you’ll get it 1 day later. If it’s deemed “unrecoverable”, we will send you a 1x replacement package, + a token. We will email your tracking number before its been scanned in at the post office. Until it has been scanned in, your tracking number will not be trackable online. Please wait till the end of day and your tracking number should appear correctly. If it does not, please email admin@craigweed.com and we will look into it.